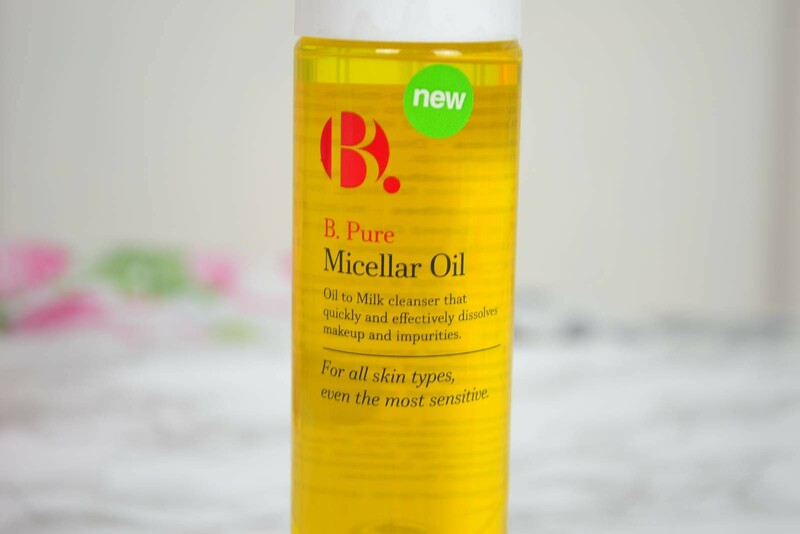 B.Pure Micellar Oil Review – Good Morning Everyone! Today I’m bringing you another beauty product review and this one is all about the B. Pure Micellar Oil which I think is a game-changer and something a lot of you will love especially with this cold weather that we’re having! As you can see this Micellar Oil comes in a bottle – it looks professional, sleek and possibly ‘simple‘ but in this case – simple is best! In the picture below – you can see that this has an oil-drop applicator, not a pipette, however what this does is allow the oil to be used sparingly as a little goes a long. OK, I know this is described as an ‘oil‘ – it looks like an oil and feels like an oil UNTIL you rinse your skin with water…..then things change! I feel like this product is a 2-in-1 product, it’s an oil to milk cleanser which is why I think it’s a game-changer…. When you look at this, apply it onto your cotton pad and skin – it looks and feels like you’ve applied an oil cleanser to your skin, it melts your make-up and removes all those horrible impurities but when you rinse your face with warm water – it turns into a milk cleanser and this is when your skin feels ‘clean‘ – I mean squeaky clean! There’s 2 different ways that I like to use this, ‘basic’ and ‘pamper mode’ – both leave your skin feeling equally beautiful, soft and hydrated! Apply B. Pure Micellar Oil onto a warm, damp cotton pad. Wipe over face and neck. Apply B. Pure Micellar Oil onto another warm, damp cotton pad and gently wipe eyes. Apply B. Pure Micellar Oil onto warm, damp cotton pad. Apply B. Pure Micellar Oil onto warm, damp cotton pad and gently wipe eyes. Using a warm face towel – place onto skin for a couple of minutes. Apply B. Pure Micellar Oil onto cotton pad. Follow up with a hydrating moisturiser! Deeply Cleanses – Dissolves waterproof and long-lasting makeup in seconds! Softens & Smoothes – With wonderful Pomegranate Seed Oil this will help to leave your skin feeling moisturised and nourished! Protects & Soothes – Vitamin E is an essential ingredient that is known to protect your skin from harsh elements whilst soothing. Purifies – Chia Seed Oil, a key ingredient which is known to purify and balance your skin! I think this is a wonder-product, if you suffer with dry/dehydrated skin then you’ll love how soft and nourished your skin will feel after use! If you suffer with oily skin – this will actually help to balance oil levels by providing your skin nourishment that it needs meaning it won’t process as much oil to keep your skin moisturised. All in all, this is a great product and when you can get this for just £3.45 – you can’t go wrong!! Click B. Pure Micellar Oil to purchase! You all know what I’m going to say – I love hearing from you and reading all your comments so let me know what you think of this Micellar Oil! Is it something that you think you’d be using often with the colder weather? Oh my goodness. This sounds like heaven. Where can I find it?